“Acacia Products took the time to understand the needs of my business - and the business needs of my clients. They explained each step of the process and completed our project within budgetary requirements. Acacia was formed in 1983 to satisfy a local need for an experienced extruder of plastic engineering profiles for the lighting industry. Since its inception, the Acacia Group of Companies has expanded its market and technologies to service a far greater custom plastic extrusions marketplace of industrial and building plastics, lighting and the equine industry. Acacia maintains its primary role as a niche business, offering a personalised service to all our clients. We are committed to developing unique, high quality products that best meet our customers’ needs. We believe quality begins with a thorough understanding of a project’s requirements, continues through all subsequent stages of manufacture, followed by professional after-sale assistance. Acacia recognises fierce competition from Asia and a market reluctance to invest in product tooling. To meet these concerns, we have developed a unique process that provides substantially lower cost, subsidised tooling for custom plastic extrusion profiles. Our clients have the opportunity to expand their product diversity at a lower financial risk than the market norm. Acacia also focuses heavily upon developing and updating its own products; a necessity in today’s constantly evolving environment. A considerable proportion of our manufacturing capacity is taken up in the development of new processes, so as to cope with the future demands of an evolving marketplace. 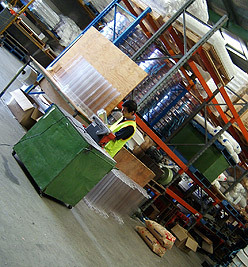 Our manufacturing plant in Western Sydney runs 6 extrusion lines, 24 hours a day. Our products are used in local, interstate and international applications. Acacia Products is proudly and wholly Australian owned. Copyright © 2019 Acacia Products. All Rights Reserved.